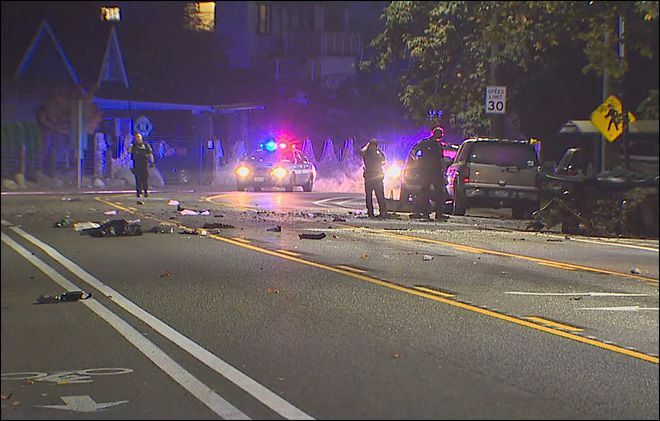 A driver and passenger were both hospitalized early Thursday morning after being seriously injured in a high-speed crash in the Rainier Beach area, according to police. According to a news report from KOMONews.com, officials received multiple calls about a serious crash in the 9700 block of Rainier Avenue South just after 1 a.m. Thursday. First responders arrived at the scene to find a single vehicle collision and a significant amount of debris from the vehicle scattered throughout the street. The driver, who has not yet been identified, had apparently been ejected from the vehicle and was lying in the roadway with critical injuries when first responders arrived at the scene. The passenger was still trapped inside of the vehicle and had to be extricated by firefighters. Both injured victims were transported to Harborview Medical Center in Seattle for treatment of serious injuries. Police believe that excessive speed may have been a factor in the car crash, and are continuing to investigate the incident in order to determine if there are any other possible contributing factors. All lanes of Rainier Avenue South were temporarily closed so that investigators could collect evidence and photograph the scene. How Does An Injured Passenger File An Accident Insurance Claim? Details surrounding this particular incident are still coming to light, so there isn’t a whole lot of information about the Thursday morning crash or what exactly led to it. That being said, early reports suggest that this may have simply been a single-car collision that resulted from the driver speeding or losing control of the vehicle. From a legal perspective, it’s important for passengers who are injured in an accident that is caused by the person driving the vehicle in which they are traveling to understand their legal rights and how the legal process works with regard to personal injury claims. In the past, we’ve spoken to some people in this position who assumed they did not have any recourse for their injuries because the driver they were riding with was at-fault for the collision. This is a serious misconception that could potentially cause countless accident victims to miss the Statute of Limitations for their case. You see, Washington state law allows anyone who is injured in an accident due to the negligence or fault of another person or entity to pursue legal action and be made whole again. This issue is just another example of the trouble with people having a limited understanding of the how the legal system works and what their legal rights are after being injured in an accident.